“Unless that bear can fly, he’s asleep,” according to Alessandro Della Vedova, mayor of Poschiavo, Switzerland. The bear in question is M13, the sole member of Switzerland’s bear population. 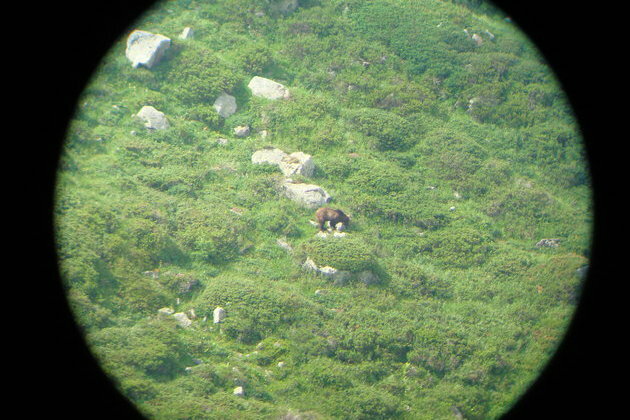 Rumors of a second bear haven’t been verified by forestry officials. M13, who was classified as a ‘problem bear’ due to his habit of breaking into mountain sheds and raiding anything he found there, hasn’t been seen in months, and there are no tracks around his last known location. He is wearing a GPS tracker, so as Mr. Vedova says, unless M13 has grown wings, he’s dozing somewhere out of sight. This doesn’t mean he’s out of mind for the locals, who are making preparations for a grumpy and hungry bear once the snow thaws. The town is working together with regional officials, environmental groups and farmers in an attempt to smooth the way for M13 to survive another season in the wild. But just because the bear is asleep doesn’t mean he can’t be useful in other ways. The bear issue has become a popular cause with Italy’s right-wing Liga Nord, just over the border, which purports to speak for farmers whose livestock might be threatened by M13. It may be that M13 is just a convenient means of showing potential voters that the Liga Nord cares about them. People get emotional about large predators in the neighborhood. If there were ten bears, or twenty or sixty, it might be different. In areas with high bear populations, people learn (or never forgot) how to live with bears. I was hiking down a ridge in Yosemite with my family many years ago when suddenly a small pack of hikers, two adults and three children, shot past us and disappeared around a curve further down. Moments later, another small pack of adults and children did the same thing. No talking, just sprinting. We turned to see what was chasing them. It turned out to be one last hiker, mother to a couple of the dashing children, who was happily trotting along. She pulled up next to us and started talking. “That bear has got to be at least a mile behind us now. It’s our own fault – bringing peanut butter sandwiches along for the hike. Rookie mistake, should’ve known better! Got ambushed lakeside by a bear just waiting for dumb tourists like us. We had to throw the backpack at the bear to distract it.” She grinned at us. “Note to self for when we come back next year: No sandwiches in bear country!” And she raced off to catch up with her herd. A pro-bear petition which is looking to get 5000 online signatures. It’s in German, but can be signed using Facebook or Twitter. In honor of International Winnie the Pooh Day.